Oh I forgot to mention, something is going with having powered minecart rails in the near future. That will probably make switching stations and the like smaller. The piston though has greater implications, IMHO. Reversible switching for lava, water. Probably will a little effort, automated vertical conveyors. I moved my rail line between the castle and the tower underground. Makes extending it out to sek and your mine / house allot easier. I'm pondering an upgraded version of my remote programmable destination selector. The tough part is how multiplex a n^m destination matrix into a 1 bit data path. Ugh, from what I've just read it might involve gold, making it all but impossible to use (I don't think I've mined a stack yet). IIRC, there's an island in between you, sek, and I. That might be ideal place to build a station, allowing us to craft path of our aesthetic liking to each individual property. Between the spawn and the mine I've got 300+ iron so laying track for a simple point to point system isn't a problem. Its 10x faster than walking. It's going multiple places without a separate track to each one thats hard. There isn't enough room on top of that small island for 3 door boosters, one maybe but I'd have to look if even an simple 3 switch/button setup would fit. Could probably get away with 2 and make sek walk. ( Hard = puzzle ) + Engineer = challenge. this game needs: iron helmet + torch = headlight helmet. Well I was thinking it'd be the Grand Central for NN World. Take off from your island, stop there. Catch the appropriate train to your destination. It also leaves room for further expansion to possible destinations of Pandiland, Bogueslovakia, and South Lam. That seems like a bigger no brainer than the scuba gear (which i could really use for future projects). Hell, I'm so deep it gets dark enough that I need the headlight helmet to be combined with the scuba helmet. I have a tunnel from my mine to very close to your doorstep, marker is the cobblestone pillar with a torch on it. I'll leave the surface access to you so you can pick the aesthetic you'd like. Be forewarned, my layout OCD may not be able to handle this. Now are we talking that little 8x8 island next to sek, or the one were I have the small tower? Do you want a lave block to use as a welcome mat? Neither of those sounds right. I'll mark it tonight. I may be thinking of something too far off. I love Minecraft! The game is quite interesting, it reminds me a bit of Harvest Moon. It's just a tunnel with a marker at this point, deal with it however you'd like. Bogues signed on early, we got lost together, I lent him some cobbles and he went to work. I'll be in the server all night, see you guys there. I'll be on around 7. Maybe we can figure out a good location for Grand Central. Lost was an understatement, we went on a very long boat ride only to arrive EXACTLY where we started. Then after being separated Sek couldn't see my character and i had to dig a line in the dirt for directions. So after Dakar leaves and I'm stuck with a lava pit I decide to clear the area to look for diamonds. I'll let you guys see for yourself, but i stumbled into a series of tunnels that epic does not even begin to describe. Go to the bottom of the pit. Follow the path of Obsidian. Try to not get lost. Edit: It's beyond my comprehension at this point. Just picking at the surface as I burned through 80 torches worth of caves i got 90 iron. 4 or 5 separate lava areas, double that for water. Countless murky tunnels not yet explored. Jesus, I did not expect to be on that long last night. But everyone got on. I wouldn't say we got a lot done, but we did a lot. I logged on to find Bogues and sek had cleaved the beautiful waterway, so I was compelled to fashion a bridge to connect their homes. It took some time, but I think I got you guys to appreciate the thing. Certainly, it may be remodeled in the future. Working with sek last night we had the unfortunate moment where he carelessly excavated near lava and died. Most of his stuff survived, so I let it sit (My inventory was full anyway). Then, 10 sec before he finally got back it disappeared, including a few goodies I wouldn't have minded (Gold). Damn. Blaze, how big is the map now? I hope you're periodically backing this sucker up. It was really cool to see what everyone was building. I finally finished the first floor of my sandcastle. 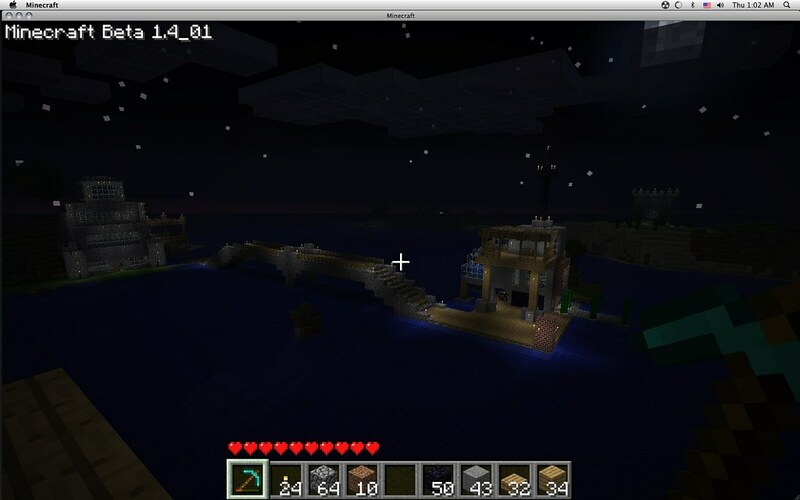 It got a little out of hand, but the ability to build uninterrupted by creepers let me plan an idea. In singleplayer my house is a warren of tunnels. I see someone already explored the hill beneath, so I'll explore those caverns and expand them. Right now its living on my Mac and Time Machine is on. And I still have to finish tearing out the blocks and replacing the water. I can only take so much tedium. The beds do reset your death spawn point in SMP. But you have to get in it after you build it. Take this as a lesson to keep a chest handy to store your loot in. And I'm not building a rail line all the way to the spawn. If you guys want to I'll be happy to install boosters. I'm thinking of wandering off and building a pyramid somewhere. And then a Ha'Tak over it. Probably Bogues. That guy was quite efficient yesterday. Yeah, thanks for the help. I'll have to put some work into that when I go polish off the bridge. Pyramids are probably the easiest and awesomest structures to build. I have one in progress in my SP game, but ran out of freakin' materials. If I do it to scale with the great pyramid I'd need ~900 blocks for the first course. I don't have that much sandstone. And I don't feel like collecting enough sand to make that much sandstone either. I doubt I'd be able to collect 126000 sandstone needed to complete it at that scale even if I could match the less that 45 deg slope, at 45 i'd need 150000. I'm not gonna lie, I'm not against the occasional inventory edit for community projects. Don't know how the great pyramids scale. Hell, making a 64 x 64 pyramid to the sky would be insane. FYI: The OP give command is limited to 64 at a time. A 64 pyramid would take ~2900 blocks and reach from sea level to the sky limit. BTW all my block estimates are just the blocks on the walls, not the floor. We'll I'm 5'8", so if i'm 2 blocks tall than a block is .85 meters. No wait, you're right, 1 block = 1 meter. I either misread that somewhere or the person was mistaken. Seriously, guys, this cave system is out-of-this world. Went through another 64 torches, found more new caves with each previous one I lit up. Picking off the walls, 20 gold, another 40 iron. So much iron and coal left visible for your pleasure. At this point getting out is very hard to do without wandering in circles for an hour. Not going to explore more until I have you guys there to branch out, and Blaze to teleport us out when we get lost. At this point I've probably discovered 30+ separate caves, with another 20 left dark at the moment. Two very large open caverns, each with two water and lava flows each and just now I discovered a massive vertical shaft, didn't have any torches left to illuminate it. Blaze should have secretly turned on mobs on you this morning. I was really worn-out on Minecraft this morning, but you're making me itch to complete some more floors in Lair just to help connect to the bowels and perhaps caverns. I'd imagine all these caves lie pretty much smack-dab under all of us. A pit at your place and Bogues would no doubt crack through into caves I've already lit up. Once you guys get down there you won't be wanting for coal or iron again, I assure you. I took all the surface diamond (7) and Gold (about 40) at this point, but I'm willing to share some Gold if it becomes more desirable. The diamond is all mine though, hehe. Even after just a small amount of play compared to my single game, I've already greatly eclipsed my amount of Iron by an order of magnitude, thanks to these caves alone. BTW, save that gold, it's all but confirmed that you'll need it for powered tracks. I'm hoping you'll only need a limited number of tracks to act as a booster, instead of needing all track as powered, which would save significantly on gold cost. I'm not going to use the gold for anything, save it I will. Just as an FYI when I was using MCEdit when you "fly" below the surface it shows tunnels. I knew that monster was there. It's similar to the cave system I was exploring in my single player world. There are 4 more systems like it in the chunks that had been generated at the time. You've probably only explored 1/10 of it. Its not a suspenseful exploring them with mobs off. Sounds like it time to turn them on if people are going to start cave diving. I know I'm ready for some mob action, but Bogues and Andi might need more time. For now, for fairness sake, I'll stay out of caves and leave the riches in wait for their next plunderer. I've got plenty of Obsidian to mine in my pit anyways. Speaking of my pit, seeing as Dakar, Bogues, and Blaze all link up to it, I was figuring we might as well link in Andi at some point. That way when cave exploration time comes, we have a central hub to start from and return to our separate bases. You guys are still playing this? I beat it like a week ago. The excess keeps on coming. The Lava pit Dakar and I discovered was adjacent and below a water source. That became the Obsidian path I mentioned earlier. The first layer holds 105, 70 of that I have already mined. Going along revealed new lava under each Obsidian and a second layer, of 105, will be ready next...with a possible third layer available. Thats over 300 Obsidian from one pit. Think I'll face my house with it. Edit: I might sign on after bowling just to say hello, but I don't plan on doing anything tonight. If you guys want to mine some of that sweet Obsidian just look for the cobblestone blocks on the right wall, those are the water plugs I used to create each layer. From the left: Bogues' Castle, Dakar-built bridge, Fatty's pad, and in the distance one of Blazes satellite towers. As seen from Dakar's roof. It sad I never thought of taking a pick from out there. I do have to say, assuming you're standing right next to the glass tower, that is not as high as I imagined. Bogues and I might have to scout around for a high local location to build a Borgia Tower on. It is nice that you can see Blaze's tower from there, though. Gripe: I know this is a public server, so feel free to shout me down, but I'd appreciate it if you guys didn't cut down large trees (i.e., those with branches) on my island. I'll be adding a tree farm to one of the lower levels of my place, and you guys are be free to gather wood from there, with the understanding that you'll just replace any tree cut down with a sapling. I'm also going to look into tunneling to a location that should be mid-way between andi and Bogue's house to grant easier access to my place from that side of the map. I'll be digging from Sub Basement 4 (i.e., 16 locks below sea-level, same floor as the path to sek's mine). Oh, on the work I did last night, I dug down to the first signs of bedrock, Sub Basement 15, which I believe would place it 4 levels from complete bedrock. I ended up having to go up a few levels create a second access tunnel to sek's which intersects with the cavern system. I then set-up a crafting and storage ares on Sub Basement 11. Well with the whitelist its not exactly public. You hit bedrock at y=6. I have a tendency to leave the branching trees alone because they take 10x as long to cut down even though they have 2-3x the wood. fyi cut them down from the top its easier. just knock 1 block out of the trunk to stop the leaves from regrowing. I think I found a good site for my pyramid but i'm gonna need twice the sandstone I have. Does anyone have a reason I can't turn mobs on friday? Ah, that was probably me, desperate for supplies the first night. Frickin newb. Last night I started tunneling into the mountain a bit. There's water, I'm not sure what I want to do with it, moat or waterfall or something. FYI, I'm planning on clearing out some of the dirt/sand between our houses for better visibility, I'll put a tree farm up high. Mob away. I have a door and a roof now, I feel safe. Metal doors are a PITA though, even though they look nicer. I'm fine with the mobs on Friday, but Andi's place might not be mob-proofed yet. That should give me time to add the appropriate doors and exits to my place. AFYI, I'm planning on clearing out some of the dirt/sand between our houses for better visibility, I'll put a tree farm up high. I think the solution here is I'm going to put a fence to create a property line. so you can build/terraform/harvest the land around you to your hearts content without concern over encroaching on my territory. Uh-oh, it's going to be Israel vs Palestine on that side of the water. Coincidentally, I settled the area with no land at all. Maybe I'll annex some of Dakar's property with an Obsidian shelter. I will build a glass wall to the sky around my land and water to keep you from expanding. But yeah, I'll be taking a good amount of land purely to have a scenic landscape. Dakarstone National Park. I'm planning on clearing out some of the dirt/sand between our houses for better visibility, I'll put a tree farm up high. I bet if you made it like the land was just sloped lower instead of the remains of a pit he wouldn't even have noticed right away. I didn't see it, but the tree that was murdered and organs harvested is around where I'm thinking for the property line. Instantly noticeable from my place because it was a bad mofo of a tree. My place is the the one surrounded by water and bridges. Feel free to move in and take anything you want. That sounds like exactly what I apparently told my wife when we got married.